Diksha McCord’s account of her 2017, Ayurvedic Healing and Yoga Retreat in Kerala. 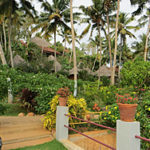 This was our eleventh year leading a yoga retreat in Kerala, India. Our group of 13 people were wonderful, and open to learn and experience India’s traditional, natural system of medicine: Ayurveda, which is a 5,000-year-old integrated approach for preventing and treating illnesses using interventions, natural therapies, and lifestyle training. This is a special type of warm medicinal oil massage in which strokes are given according to the circulatory channels for 45 minutes. This treatment is very useful for fatigue, body weakness, nerve disorders, obesity, and lose of skin luster. This treatment is nurturing. Your body is lubricated with warm herbal oil, and you feel grounded and energized afterwards. ‘Sira’ means head and ‘Dhara’ is the continues flow of a liquid. Different liquids can be used such as: herbal oils, medicated milk, medicated butter milk etc. They are poured on the forehead in a special method for about 40 minutes. This treatment is mainly for insomnia, loss of memory, headaches, mental tensions and certain skin diseases. This treatment is very relaxing for the mind. You feel calm and uplifted mentally afterwards. You sleep deeply that night, and it can enhance your meditation. As I reflect back on all my years of receiving Ayurvedic treatments, I feel they helped to bring my body back into balance. The effects of the treatments last up to eight months, which helps keep me well and able to serve others. Develop and express the highest within us. Live in harmony with our inner nature and the world around us. 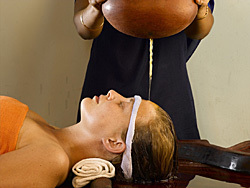 To gain the most from the Ayurvedic treatments, one has to be receptive in body, mind, and soul. So before I receive any treatment, I consciously try to relax physically and mentally, and keep my heart open. During the treatments, I keep my eyes closed and my gaze lifted to the point between the eyebrows, the center of higher consciousness. I repeat a mantra or an affirmation, and visualize God’s light flowing through the practitioner’s hands into my body. I use my breath to help me relax. I try to stay quiet, inward, and receptive. This year I stayed an extra week by myself, after Gyandev and the rest of our group left. My goal was to relax deeply, and to BE still. 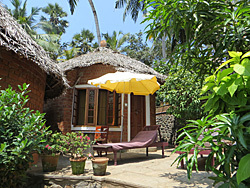 I moved to a small, secluded cottage and continued to have Ayurvedic treatments. During the next six days, I gradually withdrew from outwardness. 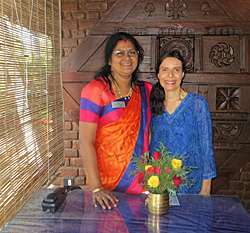 I met daily with my Ayurvedic doctor, Sreelatha, whom I respect for her knowledge and her 30 years of experience serving patients. My main therapist had treated me for many years now, and intuitively tunes in to my needs. After each of my treatments, I went to my cottage and rested. I also spent time resting in the hammock, gazing at the blue sky, and doing NOTHING. To my relief, my mind cooperated, and fewer and fewer thoughts occupied my mind. 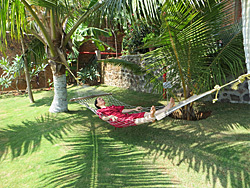 The beauty of nature in the resort supports the healing process. In the late afternoon, I took a meditative walk, enjoying the flowers, trees, and butterflies, while listening to the sound of the birds and the ocean waves. This was the first year that I was able to let go of my “To do list” and all outward stimulation, and to relax into “my inner haven of peace.” It was a profound and deeply rejuvenating experience on physical, mental, and spiritual levels. A few weeks after coming home, I was aware of the benefits that this experience provided. I realized the importance of taking time to pull back from everything that is familiar, to help refresh oneself, to see things with new eyes, and to appreciate what one has in one’s own life. When we are able to withdraw from the world, it refreshes our brain, heals our perception of the world, and gives us a new perspective on life. The daily practice of breathing techniques, yoga, and meditation helps one to consciously withdraw and detach from the busyness of life, and to refresh and rejuvenate oneself. This trip made me appreciate these practices more than ever. 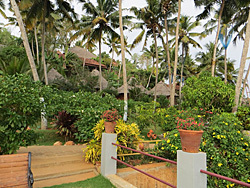 Enjoy our Kerala Photo Album from past retreats to get a better feel for this blissful experience. 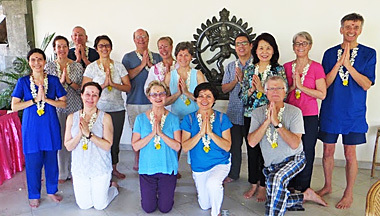 This entry was posted in Spiritual Travel and tagged Ayurvedic treatments, hatha yoga, Healing, India, Kerala, meditation, The Deeper Teachings. Bookmark the permalink.